Graduation is a grand achievement and the perfect time to appreciate the graduate for all their hard work, well performance and wishing a bright future ahead. Really, their hard work deserves some thoughtful words of inspiration so that they could go more ahead towards the way of better future and do more great things. 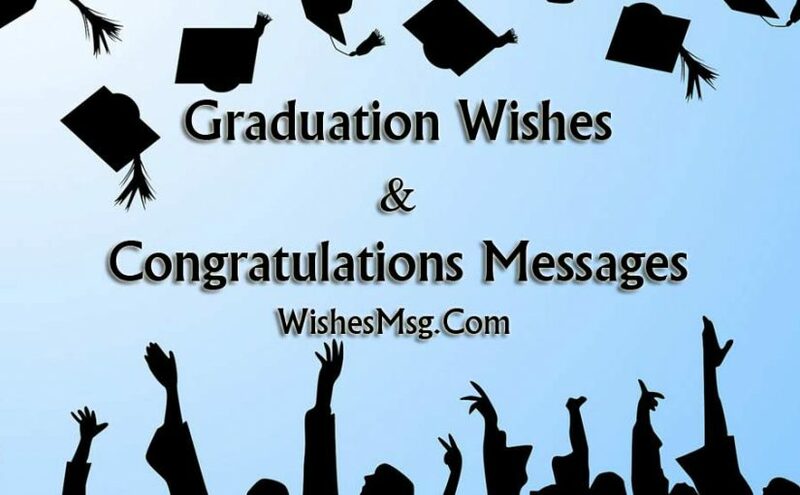 Express your thoughts to inform them that you are proud for him/her great accomplishments and congratulate the graduate by these Graduation Messages and congratulations quotes. 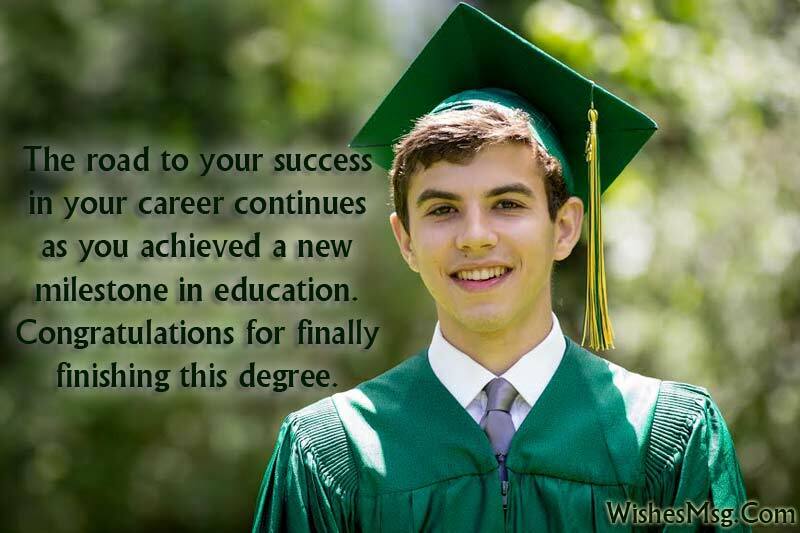 Some simple words like ‘congratulations graduate’ or ‘keep up the good work’ can make their heart melt or send a personalize graduation wishes to inspire them on their way. If you want to send a card then read these sample graduation messages from this page to give yourself clear ideas about what to write in a graduation card to congratulate the newly graduate. Your graduation is a great achievement, but that’s nothing compared to what life has in store for you next with even bigger challenges and opportunities. You dreamed, you planned, you believed, you worked, and you conquered. Congratulations for achieving this milestone. Get ready for a whole new adventure. To graduate you require a lot of effort and time, you have made many sacrifices to accomplish this and so I am very happy for you. 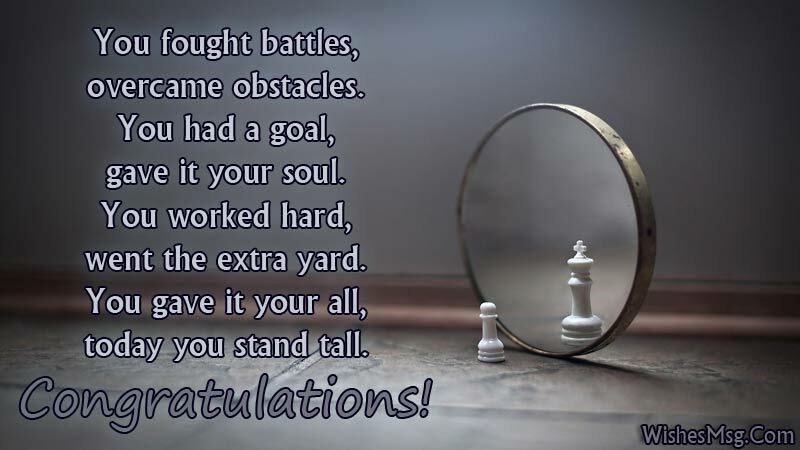 Many congratulations on this great triumph in your life. So many dreamers; but only a few achievers; and you are one of those who achieved the goal! Congratulations on your graduation! We are all proud of you. You did it! Now it’s all over, or it’s all beginning depending on which way you look at it. Not everyone is a graduate! Today you have completed one of the biggest dreams of all your life. You are going to graduate and with that you will demonstrate that far away dreams can become true. 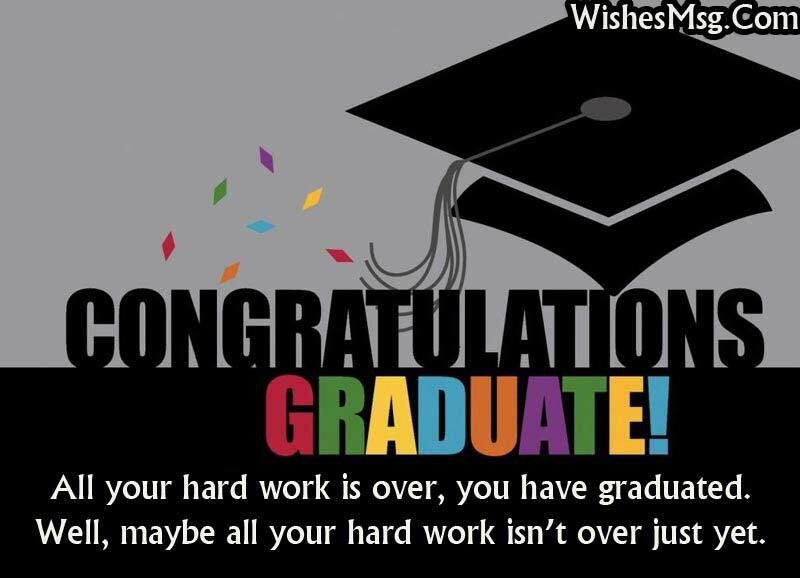 All your hard work is over, you have graduated. Well, maybe all your hard work isn’t over just yet. Congratulations and good luck! Congratulations! You have come this far. There’s no stopping now. Follow your passion. It will lead you to the fulfillment of your dreams. You have prepared long and you have worked hard for this. Get ready to face the real challenges of the world as you leave the walls of the academe. Congratulations for a wonderful academic achievement! Your time as a student has now been left behind, today will be the start of a great professional career full of achievements. Everything will be fine because you are a very dedicated and intelligent person. 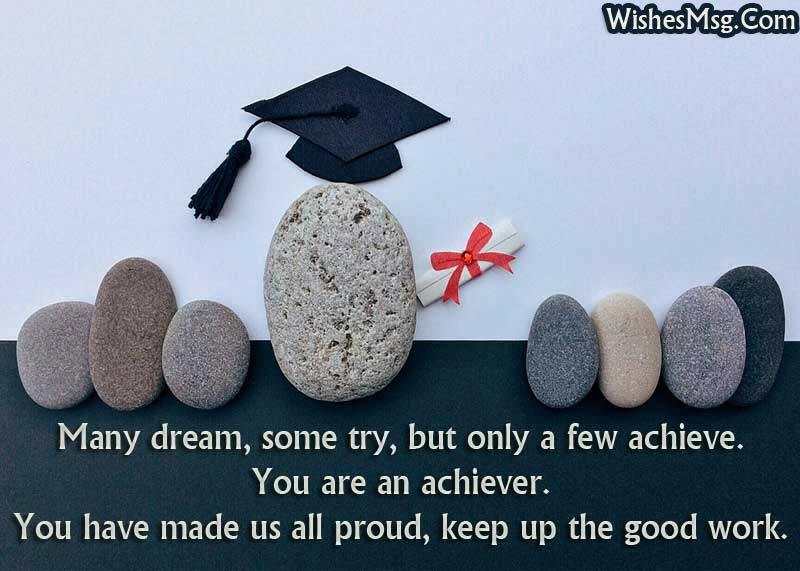 Many congratulations on your graduation. The road to your success in your career continues as you achieved a new milestone in education. Congratulations for finally finishing this degree. Graduating is certainly a milestone but Life is the biggest learning experience of them all! You’re now about to find out what learning really means. Wishing you all the best on this special day and good luck for the future. You are truly a living proof that beauty and brains can go together well. Congratulations for achieving the highest honors! We are proud of you! You will make mistakes and be wounded many times in your life. Don’t give in it’s just an experience. Wishing you to find your own star and reach for it! Your graduation marks the culmination of all the hard work you have put through your life as a student. Enjoy it, savor it and bask in the delight of achieving your goals. You have made us proud. Congratulations. I know you are passionate about your profession and as of now you can put it on practice. It really is wonderful that you are getting your degree at this young age. I wish you all the best for your endeavor. Congratulations – not just for graduating with a master’s degree, but for finally becoming the master of your own destiny. Many dream, some try, but only a few achieve. You are an achiever. You have made us all proud, keep up the good work. Congratulations on your graduation. It’s time to relax after all the work. Enjoy your graduation and best wishes with all your plans! Your degree is not just a piece of paper. It is the set of wings that will help you fly away and burst out of the horizon into a new world called “Your Life” Congratulations. Everything in life is achieved through effort. You are now about to harvest the fruit of your dedication and I can only say that I congratulate you and wish you well. Your graduation ceremony is a celebration of the fact that you are now ready to go out there and make the world a better place. Congratulations. Chase your dreams burst out at the seams, never stop trying, never stop learning, live life to the fullest. Give it nothing but your best. All these years you have done your best and now you get to see the fruit of your sacrifice. Many blessings to you and your family. Today is a route marker. It tells you how far you’ve come, not that you have finished your journey. Keep learning, keep trying, and keep accomplishing. Congratulations. All the years you have studied have not been in vain. I send my congratulations on this great achievement and hopefully one of many others that you will get. Graduation is an exciting time in your life. , Seize all opportunities that open up to you and make the most of each of them. Life is to be lived and explored! Congratulations on your graduation. Education is the key to unlocking your potential. The diploma helps a little too. May the Lord continue to be your guide as you go through the next challenges in life. He has seen your through your challenges and has brought you to this point of completion. Congratulations! Education is about understanding the possibilities that the world has to offer. Being successful in life is about understanding the possibilities that you can create by yourself. Good luck. Congratulations on your graduation! Just remember the things may not always go the way you want them to, but life has a way of taking those new directions and turning them into opportunities. All the best and good luck for the future. The power of education can’t be measured, unless you count it’s power to create a career, a life, provide for a family and most importantly – pave the way for a better tomorrow. Congratulations on getting yours. Education is the most powerful weapon which you can use to change the world. Always follow your dreams and believe in yourself. Congratulations on your graduation! People can rob you of your money but they can never rob you of your education. Congratulations for securing yours. Graduation prepares you to a new stage of life. Walking in the path of your dreams, you are half way through. Work harder and dream further. Never give up. Congratulations! With the success of graduation, comes more challenges and opportunities in life. Face them both with the same zeal and determination as you have always done. Congratulations on your graduation and best wishes for your future life. Congratulations, my dearest on being a graduate. As for your future is concerned, we’re sure you are going to make it a successful one with your intelligence. Congratulations on your more than successful graduation. Now you see how important is to have determination, optimism and patience. Enjoy the fruit of your efforts and hard work. Graduation in your last requirement before being trusted with much more responsibility. Congratulations graduate! And here’s to more responsibility. Congratulations on your Graduation Day! Your years of hard work are never in vain. Keep it up! You surely have a bright future ahead! Congratulations on your graduation. While you should always value the education that your degree represents, make sure that it inspires you to learn more rather than represents an end to your education. Whatever he/she is your son, daughter, cousin, classmates or best friend, Let’s motivate the newly graduate by these graduation messages and congratulation quotes which are encouraging and able to make them more happy on their great day of achievement. It’s your responsibility to appreciate them and wishing for many more great things during their life ahead.